There's no better way to end a tough financial year than with a much deserved holiday, so why not reward yourself? 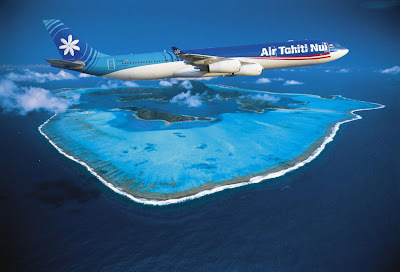 You have until 30 June to book Air Tahiti Nui's fantastic mid-year fares to Papeete, Tahiti, starting from only $1195 per person ex Sydney, including taxes, for travel between 01 November and 12 December 2010. "At this time of the year everyone is looking for the best travel deals for their end of year break," said Craig Lee, Regional Director for Air Tahiti Nui. "Tahiti is simply unsurpassed as an island getaway destination and with our special end of financial year fares travellers can get to paradise at remarkably low fares," said Mr Lee. "These deals are for travel during November and December, two of the best months to visit as the weather is at its warmest, and because this period avoids the peak travel seasons," he said. French Polynesia averages 2900 hours of sunshine per year, approximately 8 hours per day, and with lagoon water temperatures ranging from 23 to 26 degrees, it is the perfect tropical destination. The mid-year fares are valid for sale until 30 June, 2010, for travel from 01 November until 12 December 2010. For other departure dates from now until 31 December 2010, fare levels start from $1279 ex Sydney. To book contact your nearest licensed travel agent or call Air Tahiti Nui reservations on 1300 732 415. Air Tahiti Nui offers three weekly departures from Sydney to Papeete, via Auckland. Visit www.airtahitinui.com.au for more information.